As a child I can vaguely remember having my own personalised plaque on my bedroom door. 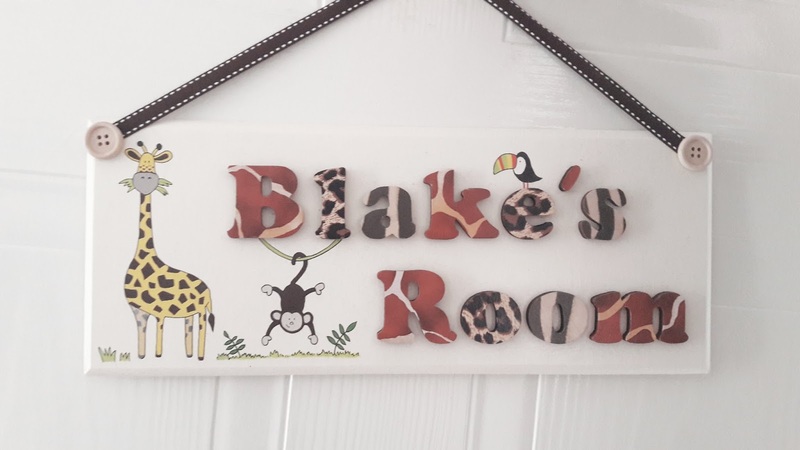 So as someone that loves all things personalised I'm surprised we didn't have a personalised plaque for Blake's bedroom door until now that is. The jungle themed plaque by Flitterbee is a handcrafted wooden plaque with beautifully painted illustrations of a Giraffe, Monkey and Toucan. The lettering is 3d and painted in gorgeous animal print which than has a varnish finish. The plaque can be hung with a brown ribbon and wooden buttons like the one we have or provided with double sided mounting tape. The size of the plaque is 14cm high (excluding the hanging ribbon) and will vary in length between 25cm and 35cm depending on the length of your child's name.Each plaque is lovingly handmade hence you should allow five days after payment for it to be dispatched. We love that the plaque is neutral so suitable for either genders and can see it being handy for children who share a room. Blake loves jungle animals and so this is a perfect design for my little cheeky monkey. I feel that by having a plaque on Blake's door it now gives his room a finishing touch that we didn't realise was needed. The plaque retails at £24.50 and I feel that price wise it is worth it due to its excellent quality and being lovingly made. Flitterbee sell a wide range of different plaques, fairy doors and other great quality prodicts so be sure to check them out. This is so adorable! I especially love how they've put the animal print on the letters too, such a cute little touch! MY name plaque was a ceramic Beatrix Potter one, I wonder what happened to it! I love those cute printed letters. Such an adorable plaque. Very cute, i'd love to have one made for my little one. The design is great and the animal print on it as well. This looks so perfect, i like it is designed.